Palestine, a country consisting of Gaza and the West Bank, faces ongoing conflict with Israel, political instability and resource insecurity. 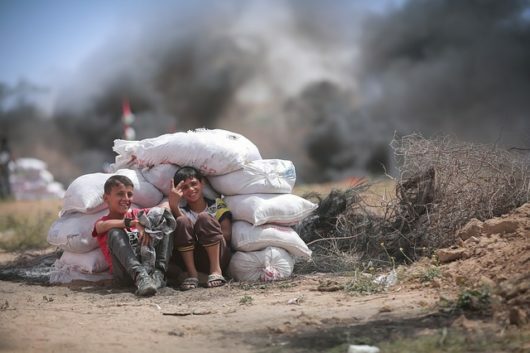 While the historical and political scenario of Palestine is complex and cannot be simply explained, in the text below top 10 facts about poverty in Palestine are presented in order to provide a clearer picture of the situation in the country. Poverty is widespread and severe in Palestine. Palestine Central Bureau of Statistics finds that 29.2 percent of Palestinian individuals lived in poverty in 2017. In addition, 16.8 percent of Palestinians live below the poverty line. Individuals that live below the poverty line are unable to acquire the necessities of food, clothing and shelter. Poverty is particularly acute in the Gaza and Palestine’s refugee camps. While the 13.9 percent poverty rate in West Bank is alarming, over half of the individuals in Gaza and 45.4 percent of individuals in refugee camps live in poverty. Additionally, 33.8 percent of Gazans and 29.3 percent of those in Palestinian refugee camps live below the deep poverty line. Over 1.5 million individuals, displaced due to the 1948 Arab-Israeli war, 1967 Six-Day War and Israeli occupation, live in Palestine refugee camps in Lebanon, Jordan, the Syrian Arab Republic, the Gaza Strip and the West Bank. Poverty in Palestine is on the rise. Palestine’s poverty level increased by 13.2 percent from 2011 to 2017. In the next two years, the World Bank predicts a decline in real per capita income and an increase in unemployment, given that the current scenario of Israeli restrictions and internal divide between West Bank and Gaza persists. Unemployment is alarmingly high. Unemployment in Palestine reached 27 percent in 2017, with unemployment in West Bank at 18 percent and Gaza at 44 percent. In fact, Gaza had the third highest unemployment rate in the world in 2017. The actual rate of unemployment in the West Bank and Gaza is higher than reported as these rates do not account for those who have dropped out of the labor market. Israeli settlements and import restrictions led to increased unemployment by damaging the Palestinian economy through increased production costs and decreased land and resources available for production. Foreign aid has played a large role in reducing poverty in Palestine. According to the Palestine Central Bureau of Statistics, public aid has reduced the poverty percentage by 11.5 percent, with deep poverty reduced by 20 percent. International aid, with the U.S. and U.K. as leading donors, is critical for the Palestinian economy. The West Bank’s economy is seen as fully dependent on aid and 80 percent of Gazans relying on humanitarian aid for survival. Just under a quarter of all Palestinians are food insecure. Many Palestinians lack the resources to put substantial meals on the table. Food insecurity poses a threat with 32.7 percent of Palestinians or 1.5 million people that are food insecure. In Gaza, this figure jumps to 68.5 percent. Water quality is low, particularly in Gaza. Water experts have agreed that 97 percent of the water in Gaza is polluted. Dangerous diseases such as diarrhea that now affects 80 percent of children under the age of 3 have become more widespread as a result. Some Israeli policies hinder Palestine’s economic growth. A 12-year blockade of the Gaza strip, a separation wall in the West Bank and time-consuming checkpoints are all Israeli policies that harm Palestine’s economy. Israeli land restrictions in the West Bank lower Palestine’s GDP by $3.4 billion a year, or 35 percent of Palestine’s economy, by restricting Palestinian access to agricultural and resource-rich land. Gaza is currently facing an electricity crisis. The two million Palestinian residents of Gaza receive electricity for no more than eight hours each day. According to the United Nations Office for the Coordination of Humanitarian Affairs, for the past decade, Gaza has suffered from a chronic electricity deficit or a situation where demand for electricity far exceeds the supply. The shortage of electricity has decreased the availability of water, sanitation and health services, along with undermining Gaza’s fragile economy, particularly the agriculture and manufacturing sectors. Many organizations are working persistently to alleviate poverty in Palestine. One of those organizations is the United Nations Development Programme (UNDP) that gives support to the most vulnerable communities through sustainable economic empowerment approaches that decrease dependency on aid. An example of a UNDP project is the Deprived Families Economic Empowerment Programme, a project that aims to graduate impoverished families from being recipients of humanitarian assistance to being economically self-sufficient by providing services specific to their needs. The financial services provided through this program generated 23,000 paid and sustainable jobs and 9,560 family-owned enterprises. The Boycott Divest Sanction (BDS) movement also intends to improve the lives of Palestinians through applying economic and political pressure on Israel to end their occupation of Palestine. These top 10 facts about poverty in Palestine are just snippets of the complex picture of political, historical and economic factors that influence the Palestinian standard of living. There is no magic bullet solution to poverty in any country, but a combination of international support and political collaboration has the potential to greatly improve the lives of many Palestinians. Less than 40 years ago, close to 42 percent of the world’s population was living in extreme poverty. People living under these conditions often cannot buy basic necessities like food and do not have access to clean water. They face starvation and disease on a daily basis. However, in 2018, the world has become a better place, slowly but surely. By today’s reckoning, fewer people than ever before are living in extreme poverty, and it is something to celebrate. Though there is still a lot of work to be accomplished, the fact of the matter is that extreme poverty is declining everywhere. The current standard of determining extreme poverty is whether someone is living on less than $1.90 per day. There is often debate over whether extreme poverty is truly ending or if contemporary standards for determining poverty rates are too low. Current research has determined that extreme poverty rates are declining no matter what amount per day is being used. Despite the negative effects of the 2008-2009 financial crisis on the global economy, the world community has made significant strides towards ending extreme poverty. A report published by The World Bank in 2016 found that from 1981 to 1990, the percentage of those living in extreme poverty had declined from 42 percent to 35 percent. The later study published that from 1990 to 2013, the number of people living in extreme poverty had reduced to 10.7 percent, meaning that, in those two decades, about 1.1 billion people around the world clambered out of extreme poverty. Between 2008 and 2013, The World Bank found that earnings increased by 40 percent for those living in extreme poverty. And just between 2012 and 2013, the number of those living in extreme poverty dropped by 100 million people. After 2016, that number lowered to 9.1 percent. Using data identified as beneficial in lowering a country’s poverty rate, The World Bank boiled their findings down to six crucial steps that a country could make to lower their poverty rates. The World Bank study noted that the most significant declines in extreme poverty came from the Pacific Islands and East Asia. Approximately 50 percent of those still living in extreme poverty today will be found in Sub-Saharan Africa. This region of the world will require the highest amount of foreign aid and relief efforts looking into the future. Those individuals who are fortunate enough to live in areas of the world predominantly above the poverty line can do their part by contacting their representatives at both the local and national level. Furthermore, continued support through foreign aid is crucial to the ongoing development of regions that need help the most. Today, it’s estimated that 775 million people still live below the poverty line, often on less than $1.90 a day. The global effort is getting closer to eliminating that number every day. These 10 facts about poverty’s role in terrorism demonstrate that a lack of access to basic necessities can make people desperate enough to engage in terrorist activities. Hopefully, acknowledging poverty as one of the root causes of terrorism will help people find ways to eradicate it altogether. The connection between lack of education and poverty is of a cyclical nature, with each one leading to the other. Documentation of how lack of education creates poverty dates as early as the 1966 publication of the Coleman Report, as this report demonstrated that, when compared to their middle and upper-income counterparts, lower income students were less likely to perform well in school. When looking at the connection between education and poverty, it is essential to consider a variety of factors, including health and women’s empowerment. Since each of these factors is improved when people are better educated, improving these factors then helps to decrease global poverty. Educated people are less likely to suffer from poor health since they better understand how to prevent the contraction of various diseases. A study in Uganda demonstrated that in rural Uganda, those who were educated were 75 percent less likely to suffer from HIV/AIDS. HIV/AIDS rates are cut in half among younger people who are educated through primary school. Education is also linked to maternal health and the health of children. When mothers are more educated, they are more likely to seek care during pregnancy, and they are better equipped to care for their children. Mothers that are educated are 50 percent more likely to seek immunization for their children than mothers who have no schooling. Additionally, children of educated mothers are over twice as likely to live to the age of five than children of uneducated mothers. Statistics documenting the link between education and health — specifically the health of women and mothers — also demonstrate how education improves women’s empowerment. Young girls who are educated are less likely to marry at a young age. This fact means that they have a higher chance of entering into the workforce and not relying on their husbands and families for financial support. Women’s empowerment through education is another factor that demonstrates how lack of education creates poverty. Women who are educated are able to develop better decision-making skills which allow them to succeed in the workforce. For women who are educated beyond grades three and four, each additional year of education leads to 20 percent higher wages, a fact that clearly demonstrates the link between education and poverty. Research clearly indicates that if people lack the basic skills to read and do simple math, they will be less likely to get a job. An inability to get a job creates a clear pathway to poverty; however, lowering school fares and increasing investment in the education sector are key ingredients in improving the amount of educated people. Between the years 2002 and 2007, an estimated 40 million more children were able to attend school, according to the Global Campaign for Education. This increase in educational attendance was due to a variety of factors including lowering school fares in countries such as Kenya, Tanzania, Uganda and Burundi, and the increase in investment in education in Latin America. Though many people claim that poverty is what causes poor education, they fail to recognize the complicated cyclical nature of the dilemma as a whole. In fact, many studies demonstrate how lack of education creates poverty. With the proper investment in education, more people can have access to education, enter the workforce and not fall into poverty. There are a lot of factors that contribute to a country’s life expectancy. Some of these contributing factors are economic conditions, diet, public health, access to medical care, wars, crime rate etc. Because of this, a lot of the countries on this list are African countries plagued by poverty. According to the CIA’s World Factbook, these are the top 20 countries with the lowest life expectancy as of 2017. The overwhelming majority of these countries are in sub-Saharan Africa. According to Africa Check, the top five causes of death in 2017 in Africa were lower respiratory tract infections, HIV/AIDS, diarrheal diseases, stroke and Ischemic heart disease. The major reasons for these causes of death are unsafe water, poor sanitation, insufficient hygiene, lack of resources and economic conditions. Living conditions dramatically affect life spans and are a major reason why these countries have the lowest life expectancy. However, there has been a significant improvement in a lot of these countries and their life expectancy numbers. For example, Zimbabwe and Zambia’s longevity has increased by 38 percent since the year 2000. And, overall, of the 37 countries that have seen increases in their life expectancy numbers by more than 10 percent since 2000, 30 are in sub-Saharan Africa. Additionally, not even one sub-Saharan country had its life expectancy fall between the years 2000-2014. There is still a lot of progress that needs to be made in order for these countries with the lowest life expectancy to increase their numbers, but regardless, there has been a substantial improvement in these struggling countries. Not all poverty is created equal. Poverty in a developed country is not the same as poverty in a developing nation. Here are 5 things the U.S. needs to know about extreme poverty. People who live in extreme poverty are deprived of basic human needs such as access to food, clean water and shelter. To be classified as a person living in extreme poverty, one must be living on or below $1.90 a day. Extreme poverty in a developing nation is different from poverty in a developed nation. The U.S. is a developed nation. In the U.S., government benefits keep millions of Americans out of poverty. These programs mostly tend to target women, children and the elderly, the nation’s (and the world’s) most vulnerable populations. Due to programs such as Social Security, unemployment benefits and food stamps, these people are shielded from the harsh realities of extreme poverty. Unfortunately, government benefits tend not to exist in developing countries to aid their poor. In addition, due to fear of corruption, the world’s poorest do not receive as much foreign aid as their better-off peers. Low-income countries remain in poverty due to being too poor to be trusted with funds. An effect of this is that the most defenseless population in the world, children, suffers the consequences. The World Health Organization estimates that about 16,000 children under the age of five die each day from preventable causes associated with extreme poverty. The causes of death are lack of access to clean water, lack of access to healthcare, malaria, newborn infections, poor nutrition and diarrhea. Death from these ails is unfathomable in developed countries. The number of people in extreme poverty is declining. In 1990, there were 1.1 billion people living in extreme poverty. Today the number is 766 million. This is an amazing feat that can be attributed to a combination of factors such as trade between developed nations and developing nations, foreign aid that reinvigorated economies, increased education, improved infrastructures and investment in basic health. As with most things in life, poverty cannot be viewed through a single lens. It is a complex social issue, but gains over the past few decades have shown that it is a solvable issue. With continued foreign aid and trade, the world can get that much closer to realizing the goal of eradicating extreme poverty by 2030. The Philippines’ poverty rate decreased from 25.2 percent in 2012 to 21.6 percent in 2015, according to the Family Income and Expenditure Survey (FIES) conducted by the Philippine Statistics Authority (PSA). The drop in the Philippines’ poverty rate coincides with a steady decline for extreme poverty in the country. In 2015, 12.1 percent of the population lived in extreme poverty. Those who classify as living under extreme poverty are those whose earnings cannot buy three meals a day. But despite the decline in these numbers, there are still glaring problems regarding the issue of poverty. One of the more prominent ones is the continued prevalence of poverty within most of the basic sectors in the country. Five of the nine basic sectors determined by the PSA—farmers (34.3 percent), fishermen (34.0), children belonging to families with income below the official poverty threshold (31.4), self-employed and unpaid family workers (25.0) and women belonging to poor families (22.5)—have higher poverty rates than the general population (at 21.6 percent). Farmers and fishermen consistently registered as the two sectors with the highest poverty incidence since 2006. Not surprisingly, the poorest regions in the country lay in the rural and agricultural areas, particularly in the island of Mindanao, an underdeveloped region that has also served as a battleground for Muslim militants and government forces for decades. The Autonomous Region of Muslim Mindanao (ARMM) registered the highest poverty incidence in the survey. Additionally, 53.4 percent of its 3,781,387 residents live below the poverty threshold and 30.1 percent live in extreme poverty. In contrast, the Philippine capital of Metro Manila had the lowest proportion of the poor. Only 6.5 percent of the population lived below the official poverty line. The downward trend in the Philippines’ poverty rate have most experts hopeful that poverty will continue to fall. Some are quick to cite that despite the fall in numbers, there are still more than 26 million Filipinos who remain poor, with 12 million lacking the means to feed themselves. However, most agree that addressing the basic roots of poverty also must address graver issues that stem from it. Drops in the Philippines’ overall poverty rate do not matter to those who see no way out in war-torn towns, says counterinsurgency expert Justin Richmond. “The widespread vulnerability that you see in every area dealing with radicalization is lack of economic opportunities,” Richmond says in an interview with Rappler, a Philippine news organization. Richmond also maintains that only in improving the standard of living in underdeveloped areas can the government truly prevent a possible radicalization of citizens. “It’s all based on vulnerability,” Richmond concludes. Laos is a poor communist country — the result of a complicated history. Since declaring sovereignty in 1954 American contributions poignantly shape Laos’s physical landscape, albeit initially with bombs. More recent U.S. administrations, alongside international investors, have bequeathed the type of strategic investments in Laos that encourage economic development and social prosperity. Poverty in Laos is shifting. The Lao people experienced a prolonged period of civil war and armed conflict immediately following independence. After years of abounding poverty, the economy writhed amid growing American anti-communist actions in neighboring Vietnam and Cambodia. The fighting soon leached across Laotian borders as part of a wider U.S. bombing campaign. While Laotians initially measured U.S. contributions only in terms of explosive tonnage, current administrations have retooled U.S. foreign policy in Laos to encourage growth. These efforts require a detailed understanding of Laos and its people. Agrarianism dominates Laotian society. Rural farmers require an adequate road system to bring agricultural goods market. In 2015, only 14 percent of all roadways in Laos were paved. Poverty in Laos exists predominantly in rural areas, the same locations growing crops with an inadequate transportation infrastructure. The combined impacts of civil war and a U.S. bombing campaign in Laos staunched civil progress and economic prosperity. In an effort to help improve impoverish conditions in the country, a U.S. State Department’s principal foreign policy objective regarding assistance to Laos is to help the country meet its development goals. President Obama visited Laos in September 2016, marking the first trip by any U.S. president to the country. Likely his last Asian tour as president, Obama’s trip highlighted the U.S. strategy to rebalance Asia and the Pacific. In a speech to the people of Laos, the president alluded to the U.S.’s assumed role to end extreme poverty through “transformative investments.” Obama also discussed diplomatic efforts that resonated strongly with two U.S. national security interests: prosperity and international order. The president pledged $90 million over the next three years to help Laotians clear American unexploded ordinance. “Over nine years—from 1964 to 1973—the U.S. dropped more than 2 million tons of bombs here in Laos—more than we dropped on Germany and Japan combined during all of World War II,” President Obama stated. The pledge enables Laotian health and prosperity within its borders and supports international order by strengthening Asia-Pacific alliances. According to sources for Radio Free Asia, “Road construction and renovation in Laos are usually plagued by corruption with exorbitant costs.” Assistance simply does not end after the deposit. The U.S. must follow through, providing the appropriate accountability and oversight. The takeaway reveals how detailed research, analysis and understanding allow the investor to achieve broader returns as well as dividends. Road investments and UXO removal, while altruistic to end poverty in Laos, stimulate Laotian autonomy and economic progress. An economically independent and prosperous Laos promotes the success of broader U.S. National Security Strategic goals.